Iroisie products are made with the best marine ingredients (from the Iroise Sea in Brittany) and plant ingredients proceeding from organic farming. 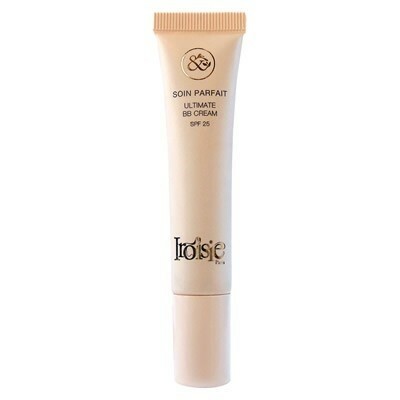 Soin Parfait Ultimate BB Cream SPF 25 combines natural pigments to guarantee a unique and efficient coverage. It contains organic anti-UV ingredients that reflect the light and a unique combination of organic ingredients: Beta Maritima, Tomato Seed oil and Cranberry Seed Oil, with antioxidant and anti-inflammatory properties, which reduce the hyper-pigmentation to soften blemishes and protect the skin. Tomato is rich in lycopene, a strong antioxidant which helps to neutralize free radicals and cranberry is rich in omega 3 and 6: your skin is hydrated, protected and looks radiant and homogeneous. WATER, ALOE BARBADENSIS LEAF JUICE (*), TITANIUM DIOXIDE,CAPRYLIC/CAPRIC TRIGLYCERIDE,GLYCERIN,OCTYLDODECYL STEAROYL STEARATE, DIISOPROPYL SEBACATE, CETEARYL ALCOHOL, GLYCERYL STEARATE, SILICA, POLYHYDROXYSTEARIC ACID, POTASSIUM PALMITOYL HYDROLYZED WHEAT PROTEIN,IRON OXIDE (CI 77492), BUTYROSPERMUM PARKII (SHEA BUTTER) (*), BENZYL ALCOHOL, MICROCRYSTALLINE CELLULOSE, CETYL ALCOHOL, ALUMINA, STEARIC ACID, TOCOPHEROL, HYDROLYZED BETA MARITIMA EXTRACT, IRON OXIDE (CI 77491), SOLANUM LYCOPERSICUM (TOMATO) SEED OIL, XANTHAN GUM, LAVANDULA ANGUSTIFOLIA (LAVENDER) OIL, HELIANTHUS ANNUUS (SUNFLOWER) SEED OIL, CELLULOSE GUM, CITRIC ACID, IRON OXIDE (CI 77499), DEHYDROACETIC ACID, VACCINIUM MACROCARPON (CRANBERRY) SEED OIL, CELLULOSE, SORBIC ACID, SODIUM HYDROXIDE, LINALOOL, GERANIOL, LIMONENE.